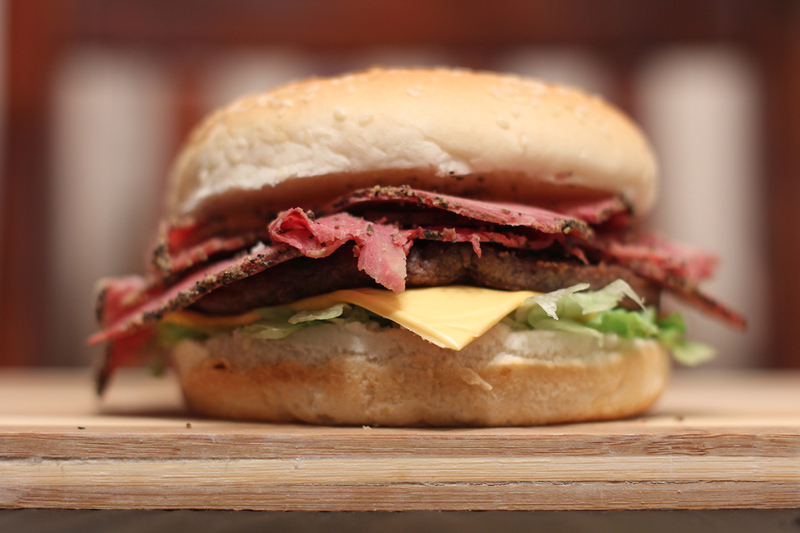 Pastrami Burger is a type of burger popularized by a fast food restaurant chain based in Salt Lake City called Crown Burgers. The food chain calls it “Crown Burger” and it is their signature dish, it is basically a cheeseburger served with layers of hot pastrami. This burger might have been introduced when the chain started during the late 70’s. It then proved to be popular and it became a common sight in most restaurants in Salt Lake City, Carl’s Jr. even released their own version called “Pastrami Burger”. Though I haven’t tried it personally I read a lot about this burger which eventually urged me to make some at home but I have to trim down on the amount of pastrami as the original one have overloads of meat on it. Cook burger patties on grill top, when it’s nearly done add cheese on top and let it melt, set aside. Heat pastrami on grill top. Prepare burger buns, add 1 heaping tablespoon of dressing, add onions and lettuce. Top with burger patty then with pastrami. Oh I love pastrami. Unfortunately we are unable to get it in Spain, occasionally I can get a visitor to bring some from UK, but that depends on the freshness due to it journey here. Next time I do get some this burger sounds delicious, thanks. It’s been a while since I have had pastrami. I’ve never had it on a burger before but it looks and sounds delicious. Whenever I order pastrami it is usually with mustard and pickles on rye bread. I’ll have to try this. I inadvertently bought pastrami and my son went crazy over it! He’d love it as a burger I’m certain! I lived in SLC for two years, but never ventured into Crown. Though that wouldn’t stop me from enjoy this burger. I’m not a beef person, but that looks amazingly yum! Altho’ I allow myself but little processed meat, must admit pastrami [I began with the Roumanian: where else could it be originally sourced?] is a firm favourite. Have even tried making it myself!! Personally I would not have it as a burger ’cause I do not touch anything made with white flour, but it surely tastes just as good with multigrain wraps etc . . . 🙂 ! I’ve heard of this but have never had one. It looks terrific! Really good job at making this – thanks. With all of that pastrami, I would just eliminated the burger and call it good; although, I’m sure the burger does make it a real burger! Thanks for introducing us to this wonderful mouthful of goodness! The photo link is broken for me 🙁 I think it sounds delicious though – I didn’t realize I liked pastrami until I gave it a shot and I love it! Especially with the 1000 Island dressing. When I make pastrami burgers I make sure I heat slices of pastrami in an oven and glazed them with my fave local honey. Nom Nom Nom! I had this for lunch today (minus the burger) and it was delicious. Pastrami is one of my favs so this was going to happen, without doubt. Was not sure on the thousand island, but had some in the fridge so went with it. Next time I’ll try it with a hot mustard dressing to compare.